Welcome to June! Overnight price action was slightly higher at the CBOT with litte volume reported. The holiday pushed back the normal market reports one day, which puts USDA export numbers out tomorrow, right at the same time as the US unemployment numbers. Today we get crude oil inventories, along with ISM Manufacturing numbers. President Trump will give a speech at 2 pm central time today, so expect some action from the US dollar pairs, which has been stronger this morning but weaker of late against major pairs. The Brazillian Real has rebounded of late as well, rallying last night to levels only a few ticks away from where it traded pre crash, two weeks ago. This should help soybeans. Weather appears to be warming with warmer and drier expected in the 10-14. That is probably bearish corn. As we begin the month, lets take a look at the monthly bar, front month continuous charts and how the look after the close of May. All charts are via Futures Source. You can bearly notice the price changes over the last three months, thats how tight the ranges have been. 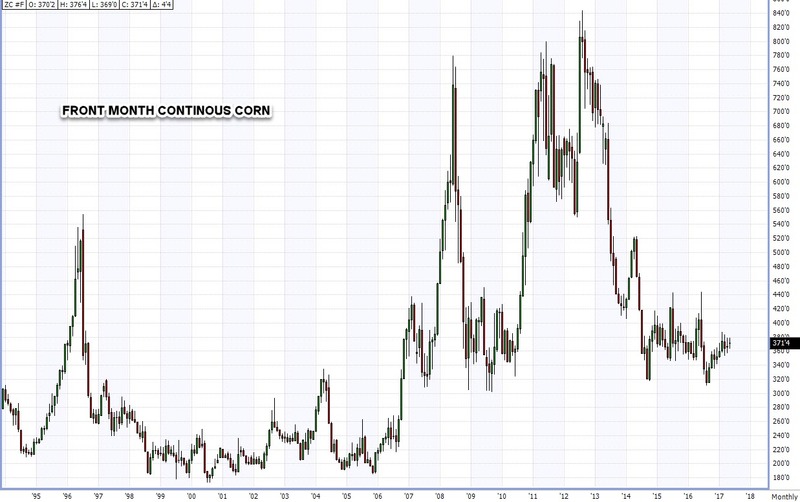 Corn sits right in the middle of the range going back to late 2014. I imagine a breakout is coming. 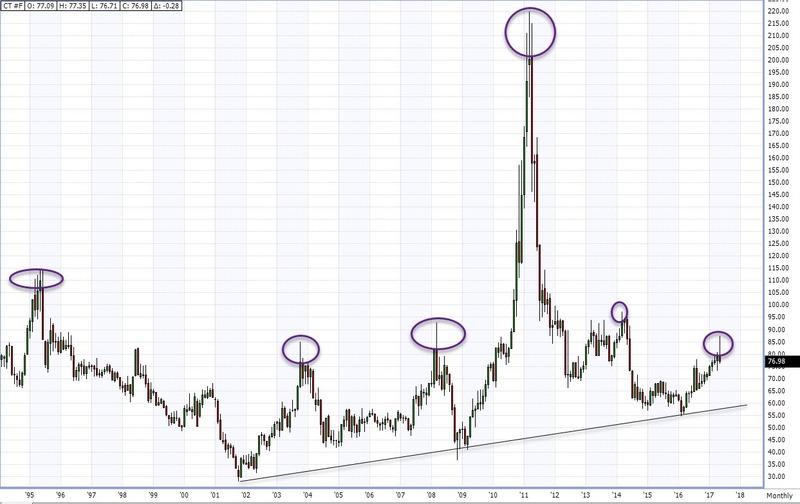 Bears would lean on it going lower first given the cheap prices in Brasil and the amount of physical poised to move over the next few months, bulls will point to the massive spec short position and US crop conditions. For now July is stuck to 370. 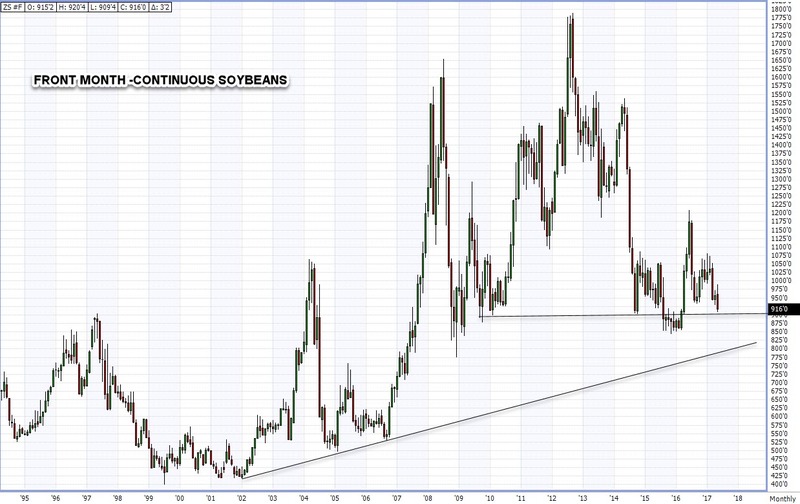 Soybeans had an outside reversal last week, tech guys tell me thatcis bad. 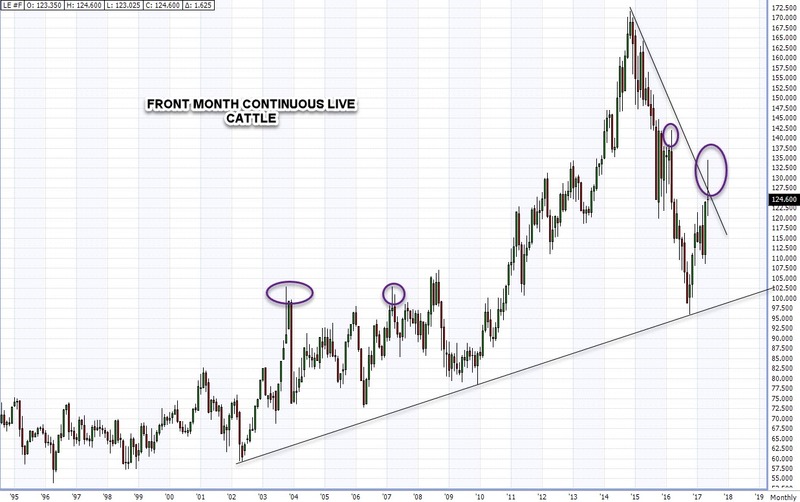 The lows made from May were the front month lows made in 2009 and 2010, and then again in late 2014. If the lows from May are tested and hold, that is a promising sign with an inverted head and shoulders pattern in there. The main difference between this time and the years prior is market structure. In 09,10 and 14 the market was inverted. This year and in 2016 it was at a carry. The bulls will point to fantastic demand in the S/D reports, a smaller US carryout than many had anticipated in the May WASDE and the now record short bean spec position. Bears will point to competition out of Brazil, and crumbling Real and the idea that weak planting numbers for corn will bring about more bean acres. Chicago wheat, much like corn is stuck in a front month range. The downtrend appears to have been broken while the long term support line going back to ’00 has held. Unlike corn, the carry is substantial between July and September. Its hard to see much risk taken ahead of the harvest. 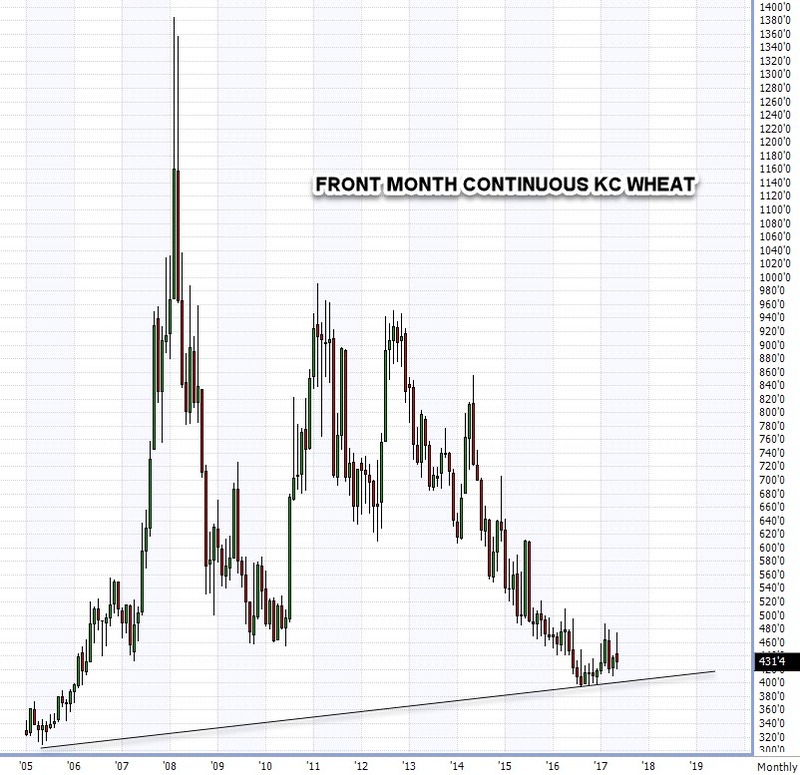 Delivery periods have been weak for Chicago wheat, bears will point to that as the reason you should be selling here. 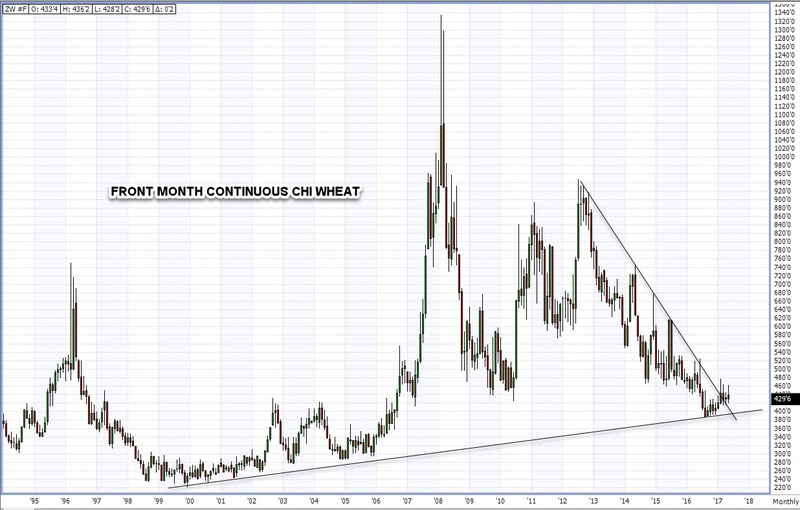 Some bulls would agree, they would look for a break of September wheat to 400 before getting long. Foreign wheat markets are beginning to show life as tighter stocks to use levels by major exporters are being exposed. Data from FS only goes back to 05 for KC wheat so we have less of a picture, but it looks very similar to Chicago. KC wheat caught a nice rally in May, giving it all back very quickly after the run up in the early part of the month as weather normalized. Flat price KC wheat futures are susceptible to the same overall supply fundamentals and carry costs as the Chi wheat. Last year producers who did not sell early stored their wheat and ate costs as the year went on, I think they go the other way this year and dump on the market what is available given the storage costs. But the high protein characteristics of KC wheat should keep that 400+ floor in tact for September. I think its a buy there, especially as the Minneapolis contract struggles. Cotton had signs of a top last month. Tech guys here tell me the big “wick” on the candle is usually the sign of a capitulation top as shorts bail out. We saw that in May. The spec position is the opposite of the CBOT markets, longs are out in full force while spec shorts are almost non existent. Bears will say “fade it all” as the crop appears to be off to a good start in the US on record acreage, both here and in India. I would agree with them but I worry about the July delivery. Global stocks remain where they have been and that move after the May expatriation could happen again in July. Bulls will point to the idea that the market is trading on the idea of a good crop, with a lot of risk remaining. The uptrend in place going back to early 2016 is a supportive technical factor as well. The live cattle monthly chart has a huge “wick” on it like the cotton, while the May bar in Feeder cattle showed more indecision. Bulls will point to very supportive demand factors like cash prices, Chinese exports, the JBS Brazil mess and the story out of India that they may be out of the export game. The bears will lean on higher COF and the downtrend still holding strong. 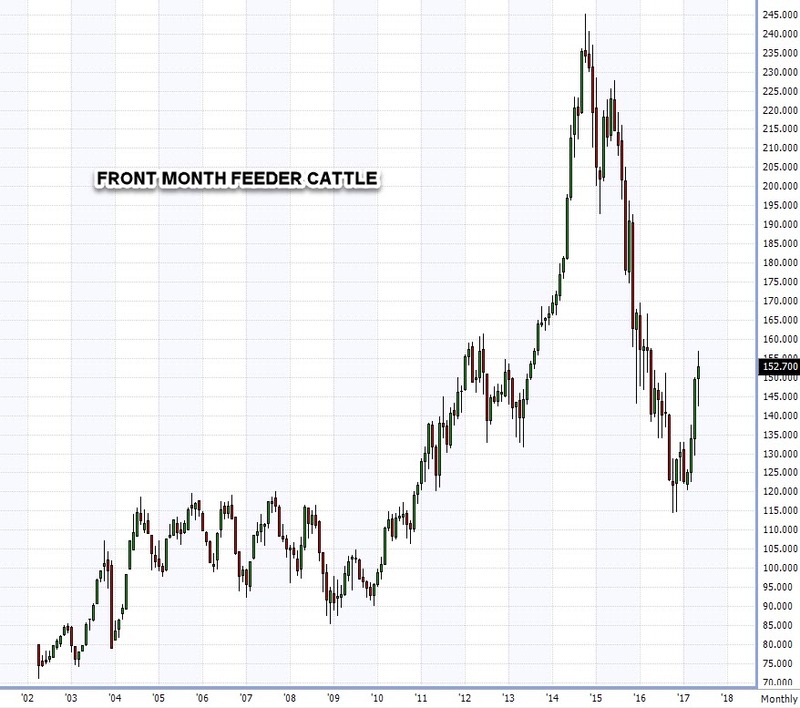 Funds in cattle have pushed the envelope, as have producers who appear to be trying to raise more head. I worry about downside in cattle but I think put strategies are the best play unless you have a good liquidity stream to handle a push to 165 in Feeders and a retracement to that recent spike high in Live. 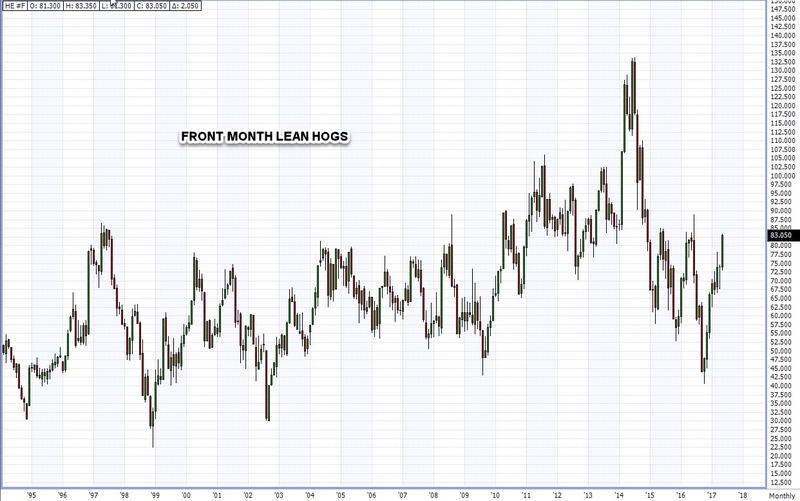 Hog markets, like cattle have had a fantastic 7 month run going back to October. Its hard for me to see the June/July contracts not making a push to 85 where the last two spikes have gone. That said, we have made lower lows in each of the last 3 years as well. My contacts in the hog industry are expecting a flood of numbers but those probably do not appear until quarterly reports at the end of June.